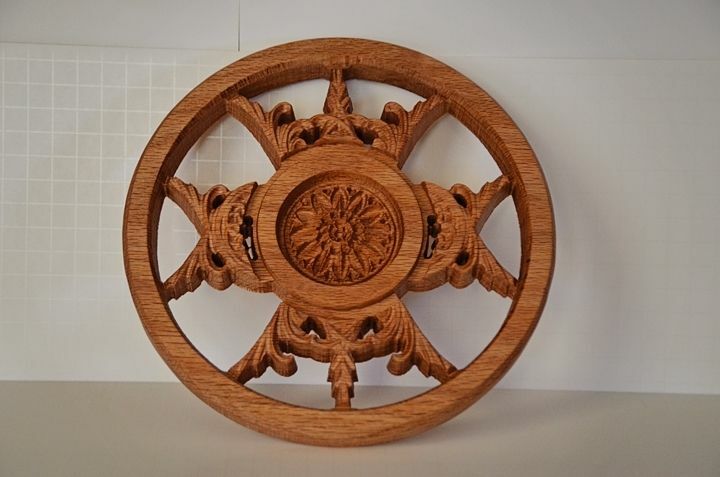 This is a very unique solid Oak Trivet. It was carved with my computer controlled carving machine. It's distinctive Filigree Pattern is punctuated by a beautiful Rosette Center Piece. It is carved out of a single piece of Red Oak and is 8 3/4 inches in diameter and 3/4 of an inch thick to well insulate anything hot or cold placed on it. It is finished in Lemon Oil so it has a pleasant smell, is food safe, and will add distinction to any place setting. It is the first item produced from my Old Town Woodwork Shop carving machine.